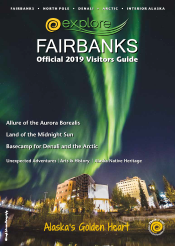 The Explore Fairbanks 2019 Official Visitors Guide is a 78-page, full-color booklet that describes Fairbanks year-round opportunities. The annual publication is designed to capture the features and attractions specific to life in the region. 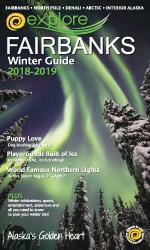 The Fairbanks Winter Guide, a companion piece to the Visitors Guide, is a 32-page, full-color booklet with winter activity listings and events calendar that offers an informative, yet a lighthearted view of winter in Alaska’s Interior and Arctic. To view the Visitors Guide or Winter Guide in a full-screen, interactive version, click on the covers below or request a free printed copy using the form at the bottom of the page. Click on a cover to view full screen.